If you're looking to step into the crisp clarity of our 4K future, it's hard to beat a price point under $400. 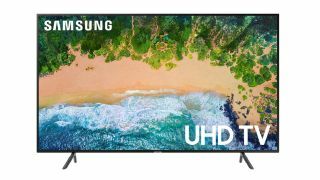 Samsung's 50", 4K UN50NU7100 is currently well under that at a mere $359.99, so if you're been pinching pennies waiting for an unbeatable deal to finally upgrade, your time may have arrived. $369.99 is actually $10 cheaper than we've ever seen this display for sale, a bargain basement price to move into the 4K era or grab a second TV for your bedroom or office. Of course, if you want to do some comparison shopping, don't hesitate to check out our best gaming TVs roundup for some other examples of great deals. This set ticks a surprising number of boxes for a TV at this price point, including HDR. It'll even upscale non-4K content up to 4K automatically, and comes packed with lots of smart TV functionality and app integration. It's incredibly slim and, for a 50" inch display, lightweight, so it'll fit practically anywhere you want to set (or mount) a television, which is great if you intend to use it as a second or backup set, or park it on your desk so you can pipe one of the best gaming PCs through it. It's ridiculously cheap for a big 4K display, so grab it before the price inevitably spikes back up.